This startup seeks to transform a long-running conflict between pastoralists from the Samburu and Turkana tribes in northwest Kenya. It has been launched by Children Peace Initiative Kenya (CPIK) an AP partner that nurtures friendships between children from warring tribes and then builds on this foundation to create deeper ties between the two communities that will make conflict increasingly unattractive. 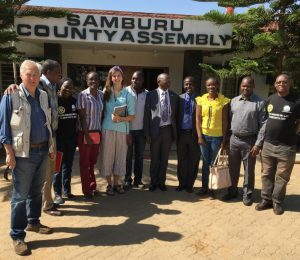 The startup will begin in 2019 in six villages of Baragoi sub-county, where Samburu and Turkana tribesmen have been fighting over land and cattle for years. One of the villages, Nachola, was the scene of a notorious massacre in December 2012, when 42 policemen were killed while pursuing Turkana cattle raiders. The startup will draw on a model of conflict resolution, based on contact theory, and take place in three phases. First, CPIK will organize peace camps for 250 Samburu and Turkana children and build friendships that will spread to parents and eventually to village elders and warriors. The goal is to end the fighting within 1-3 years. During the second phase, CPIK will encourage economic interdependence between the six villages by supporting a series of economic interventions. These will include the joint rearing of heifers, trade, and cooperation during drought. The final phase will seek to improve relations between the tribes and Kenya officials, particularly police. This formula has been employed by CPIK and its partners to end another conflict in Samburu County between the Samburu and Pokot, who have not fought since 2012. This success is described on the following pages. If the same approach can succeed in the six villages of Baragoi it could lay the foundation for a complete end to conflict in an area of 15,000 people within 5 years and offer a blueprint for resolving conflicts between communities elsewhere in Kenya and beyond. CPIK’s model may also help to alleviate the challenge of drought in East Africa, which has devastated the herds of pastoralists. Esther Lenosilale, right, was one of the first mothers to volunteer when CPIK organized a peace camp for children from the Samburu and Pokot tribes in 2012. Esther, a Samburu who is also known as “Mama Caleb,” had suffered grievously from the conflict. In addition to suffering the nightly terror of raids she had been unable to seek treatment for her father and a grandchild when they fell ill. Both died. Esther sent her son Caleb to the peace camp and credits CPIK for the peace that has followed. 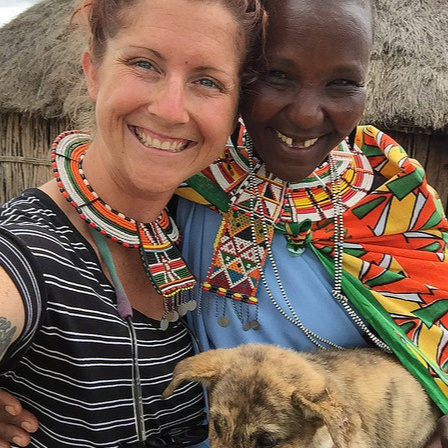 She is seen here with Eliza, a Pokot. The two mothers met after their children became friends and have been given a cow to raise together by CPIK. Mama Caleb is also making squares out of beads for a “Cow Quilt” with a Samburu friend, Mama Faith. Read Colleen’s blog. Malatu Lebenayo (Samburu) and Losuke Lonyangaking (Pokot) were among the first family elders who sent their children to CPIK’s first peace camp in 2012. Both had lost their homes and cows during the war, and taken their kids out of school. The two men became fast friends and were given a cow to share by CPIK in 2015. Malatu took the cow, which gave birth to a calf in 2018. Losuke (seen on the right) told Peace Fellow Colleen that he never doubted Malatu would take good care of the heifer. “He did. And now I have a calf because of him!” Read Colleen’s blog. Ruth Lolmoyooni (Samburu) and Celina Maron (Pokot) were among 101 families who received a cow in November 2918, under CPIK’s signature program Heifers for Peace. Both mothers had sent their children to a CPIK peace camp and become good friends. Under the agreement, one of the women will rear the cow. The other will receive the first calf. 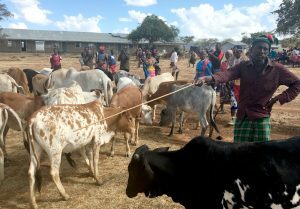 The 51 cows were purchased with funds raised by Peace Fellows Talley and Colleen and handed over at a ceremony in the Pokot village of Plesian. Read our bulletin about the Plesian event. Helen (Pokot, left) and Chebet (Samburu) were among hundreds of children who came together in July 2017 at a CPIK peace camp in the Samburu village of Logorate. After quickly bonding the two girls were officially “twinned” by CPIK, opening the way to future visits between the girls and their parents. 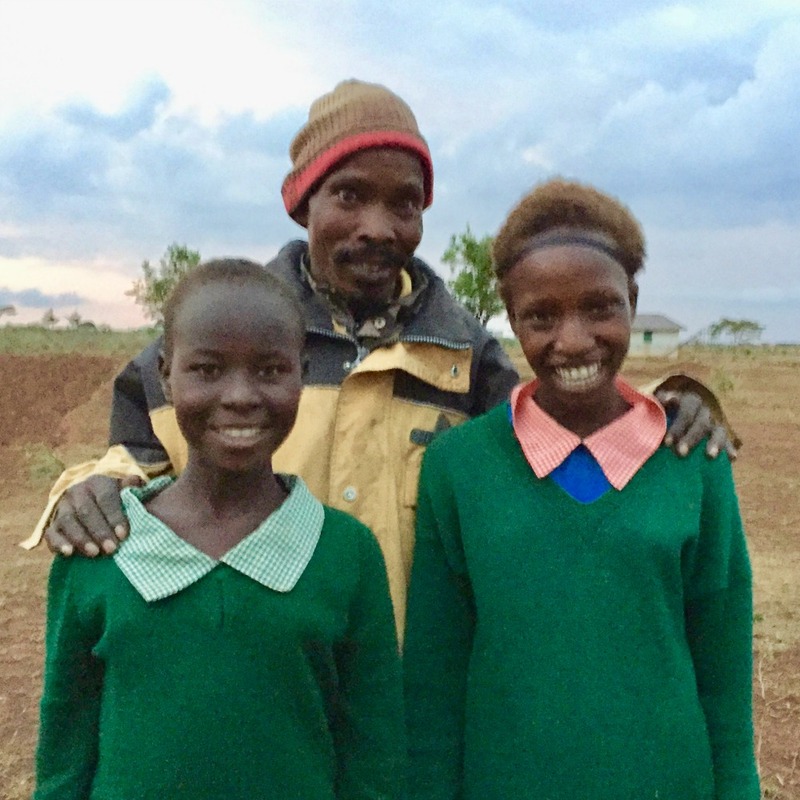 They are seen here with Chebet’s father, Lotit, who passed by the camp to see how his daughter was doing and was delighted to be introduced to her new friend. Read Talley’s blog. 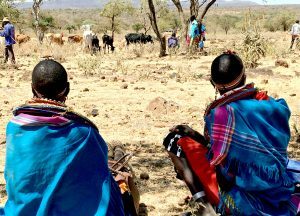 At the heart of conflict: Herders from the Turkana and Samburu tribes fight over cows in northwest Kenya. Baragoi sub-county has been the scene of conflict between Turkana and Samburu for generations, although the current violence began in earnest in 1996. The conflict takes the form of intermittent raids by bands of armed men, known as warriors. Their goal is to steal livestock – cattle, camels and goats – or to avenge such thefts. But raids can turn deadly and embroil whole communities. 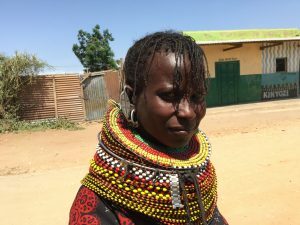 Esther Lenosilale (Samburu) lost three uncles during the war between the Pokot and Samburu and told an AP team in 2017 how she had made her children wear shoes to sleep in case they had to flee suddenly: “When the sun came up I thanked God I was till alive.“ Samuel Lemaramwit (Samburu), head of the council of Elders in Longewan village, reckons that 35 of the village‘s inhabitants (who currently number 412) were killed by Pokot warriors before the fighting finally stopped. The impact of such inter-communal conflict is devastating. During the Pokot-Samburu war, schools were closed and students were drafted into the local defense force. 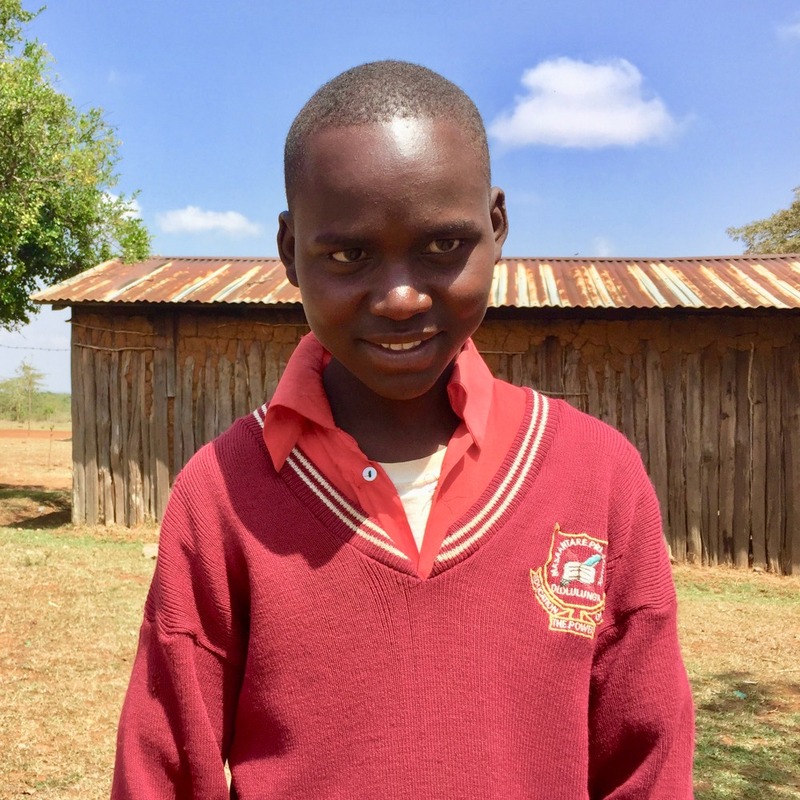 When Esther Lenosilale’s son Caleb returned to school at the age of 20 after the Samburu-Pokot fighting ended, he had missed so many years of school that he was placed in the first grade with students aged 13. CPIK estimates families were able to harvest around 2 bags of corn during the war, compared to the normal yield of over 40 bags. The cattle economy collapsed. 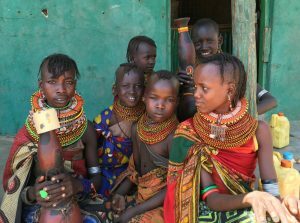 Caught in the crossfire: Women and children, like these Turkana girls, are the first to suffer when cattle raiders fight. The conflict in Baragoi has produced a disastrous separation between Turkana and Samburu. Before the violence began in 1996 both groups cultivated the fertile Namalia belt and produced food together, but today the belt is a no-go zone. Villages have been emptied, people have been displaced, and schools have been closed – some of them permanently. The two communities do not share resources. Grazing fields and water sources are contested. (There is more water on the Turkana side of Baragoi and better grazing land on the Samburu side, but this incites competition rather than cooperation.) Before the conflict, Turkana and Samburu used to trade livestock but this has stopped. There are no common markets in Baragoi, even though land has been marked out for such a purpose. The one community where Turkana and Samburu meet is Baragoi Town, which has the only truly integrated school in the sub-county. But even Baragoi Town is divided into two distinct tribal territories by the main road, and most businesses along the road are owned by outsiders (Somalis and Kikuyu). Until 1996, the two communities used a common cemetery but today they use separate burial grounds. Even the dead are not at peace. Outside Baragoi Town the separation is complete. 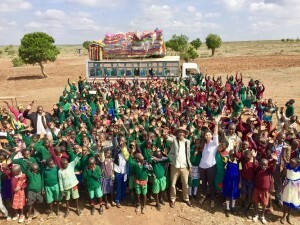 Salu Lekarere, the principal teacher at Ngilai School, one of the six communities, says his students describe Samburu kids as “the enemy” in their school papers. Not surprisingly, Samburu teachers are afraid to teach at his school. 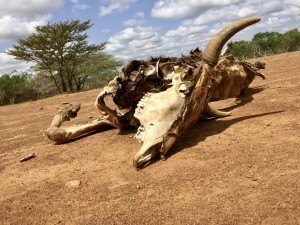 Victim of drought: Pastoralist herds have been devastated by three years of drought which forces herders to move outside their own land, provoking conflict. The authors of this mayhem are young men who are encouraged by a warrior culture which views fighters as heroes. Many grow up hating the other side and their first raid is often a rite of passage into adulthood. Samuel Lemaramwit from the Longewan council of Elders reels off the names of several Samburu fighters who achieved fame during the Samburu-Pokot war – “Lemarimpe, Lerana, Lengapiani.” The same mentality persists in Baragoi. The root cause of these conflicts is competition for cattle, water and land. Cattle are the main form of wealth and the pastoralists have by tradition followed the rain in search of the best pasture. But this has been made more difficult by drought, which forces the herds to move into the land of other tribes. George Gamiya, a former Samburu warrior turned policeman, explained that he had lost 4 of his 5 cows to drought and disease. 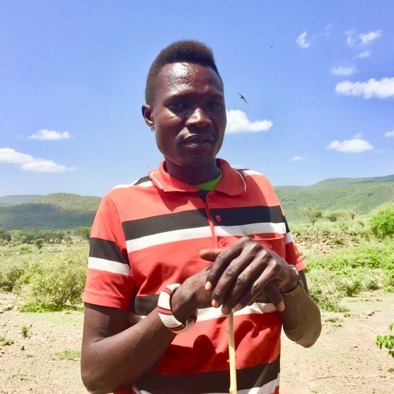 Kip Kyeng, a Pokot herder, told AP in November 2018 that no fewer than 14 of his 16 cows had died. Such losses put pressure on herders to resume rustling. They are also boxed in by a government policy of allocating large tracts of land to conservationists which are made off-limits to pastoralists. To these problems must be added bad management of livestock, and an unwillingness to innovate. Cattle herds are too large for the fragile environment and breeds are inefficient. Eating habits do not help. Chicken is not even consumed by the Turkana, even though chickens would do less damage than cows and be a good investment for women. The conflict is compounded by deep distrust between the tribes and the government. 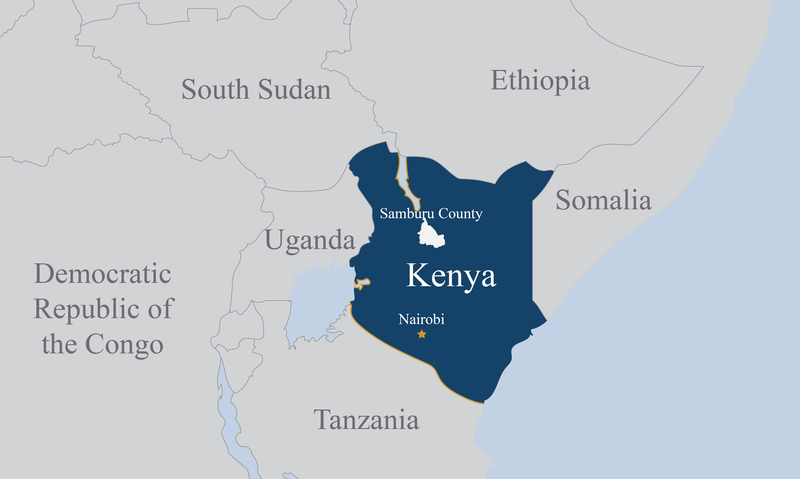 The Catholic Church administered most of Samburu County following independence, and government came late to Baragoi sub-county. Unable to quell the violence, the authorities chose to arm local militia (known as the Kenya police reserve) but this simply makes guns more available. Instead of working patiently with the communities to end raiding, the police confiscate animals by force from communities that they suspect of complicity, further poisoning relations. The Turkana also feel grievance at the fact that they only have one seat out of 6 on the Baragoi Council. Willing partner: CPIK will draw on a close relationship with the County government to tackle conflict in Baragoi sub-county. A final feature of the Baragoi conflict is an almost complete absence of NGOs. Salu Lekarere, principal of the the Ngilai School, remembers when his school boasted many partners, including UNICEF and international NGOs. Today, only the Ministry of Education remains. “Most NGOs view Baragoi as a no-go zone,” says Hilary Bukono from CPIK. These are formidable obstacles, but peace-makers have several things going for them. First, the central actors in this conflict are easy to identify, accessible, and can be influenced – which is not the case in most other modern conflicts. Second, Elders (family heads) wield great authority and are also fathers. Third, the government can encourage inter-ethnic cooperation through the judicious appointment of teachers and police, joint services, and by issuing licenses for initiatives like markets. All of this opens the way for innovative peace-building. The question is whether a small NGO like CPIK can trigger the change. To answer this we turn to the now-resolved conflict between the Pokot and Turkana. The government and Catholic Church tried for years to end the conflict and even employed workers from both sides to work together and dig a road that would benefit the two communities. None of it worked and fighting flared up again in 2008. Four years later the war began to wind down, and there have been no deaths in the years since. How was this achieved? Could it also happen in Baragoi? On the frontlines for peace: 276 children from the Pokot and Samburu tribes came together at this Peace Camp, organized by CPIK in July 2017. 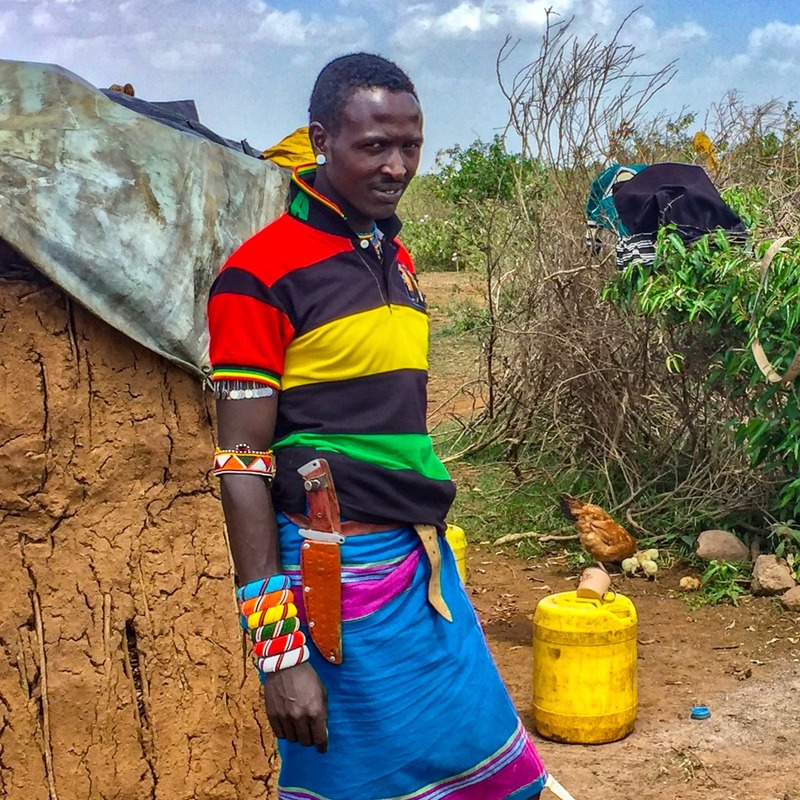 Frontline villages: The startup will work in six villages in Baragoi which lie along the fault line of the conflict and have born the brunt of the violence. These are Nachola, Natiti and Nalinga Ngor (Turkana); and Ngilai, Bendera and Baragoi Town (Samburu). Frontline villages are key to a larger solution because their inhabitants have the most direct interest in ending conflict and can influence raiders from the interior who pass through their villages. If the conflict can be halted here, it could have a calming influence on the entire region. Schools: The next step is to contact schools and work with teachers to identify children who will participate in peace camps. Once they sign on teachers will likely remain intensely loyal to CPIK and organize future camps. David Lekirenyei, the deputy principal at Logorate School in Samburu territory, has been committed from the start. He can remember when bullets came whistling through the classrooms and the school had to be closed for two years. Today, Pokot herders pass by the school without incident and the school has two Pokot students. This is a long way from integration but at least the school is functioning normally. Children: The next stage of the process is to organize peace camps for children from both sides of the conflict. Schools are asked to identify children from grades 5 and 6 who are performing well and are old enough to form friendships. The camps themselves are great ice-breakers, as Peace Fellow Colleen Denny found when she attended a camp in July 2018: “We played sports, we sang songs, (and) we had silly interactions.“ One teacher told Colleen that she had received over 40 calls from parents over the first two days asking if their kids were OK until word got out that they were all fine and that a major change was under way. Chebet (Samburu) and Helen (Pokot) became fast friends before the peace 2018 camp even began. By the end of the camp they had been officially “twinned” by CPIK. The two Pokot girls at Logorate School referred to earlier, Faith (15) and Mary (13), now spend their holidays with Samburu families. 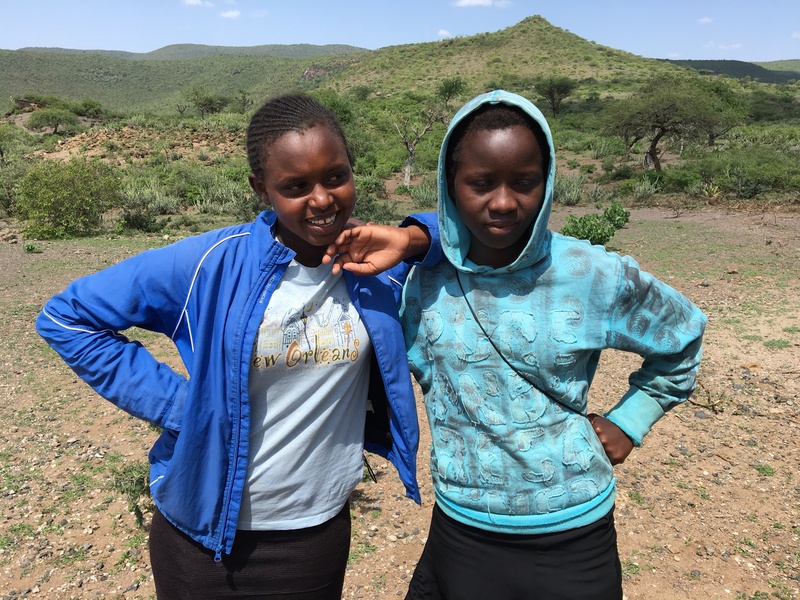 Naanyu and Diana, two Pokot girls decided to go to a Samburu boarding school to “get away from their families.“ It seemed to be working out when we met them in 2017. 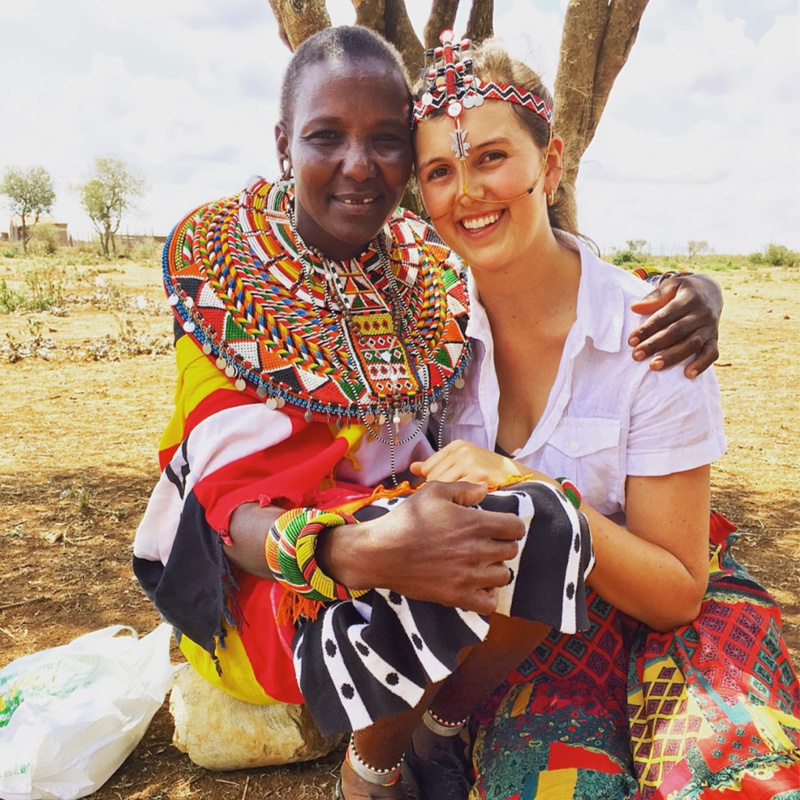 Anne (Samburu) trekked across the mountain in November 2018 to attended the ceremony with her Pokot friend Naomi when CPIK distributed cows in the Pokot village of Plesian. Such cases are legion – and heart-warming. They also show how children can start the balling rolling and become catalysts for peace – one of CPIK’s most important conclusions. Peace camps also give CPIK the chance to enrich and expand the program. Twelve schools have established children clubs, which are led by motivated students like Tanapa, 16. CPIK’s peace curriculum is now used at 36 schools. The organization is even using the curriculum to train teachers in the Nairobi slums. Families and parents: The ripple effect from a peace camp spreads quickly to parents who develop their own friendships and follow up by visiting each other’s homes. Mothers are particularly receptive to the call for peace and account for over 75% of the home-stays. 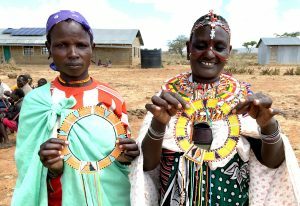 Esther Lenosilale, who is also known as “Mama Caleb“ from the Samburu village of Logorate was one of the pioneers. After her Caleb’s new Pokot friends came to stay at the family kraal, she issued an invitation to the Pokot mothers and sent them home with gifts. When 40 unfamiliar goats wandered into the village in 2017, she contacted her Pokot friends, found out that the goats belonged to the Pokot and sent them back. On the other side Joseph Lomnia (Pokot) hosted several Samburu parents after his son attended a peace camp on the other side. One of his house guests, Peter Lemoti, later joined Joseph to raise a cow under CPIK’s program Heifers for Peace. The deciders: Samuel Lemanarwit, center, heads the Council of Elders in Longewon village (Samburu). Elders play a key role in ending the warrior culture. 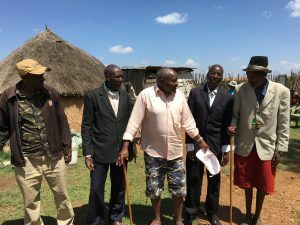 Village Elders: Elders exercise a huge influence on both sides of Pokot-Samburu divide, and led the efforts to end the war. One reason is simply that they are parents, which makes them receptive to CPIK’s approach. 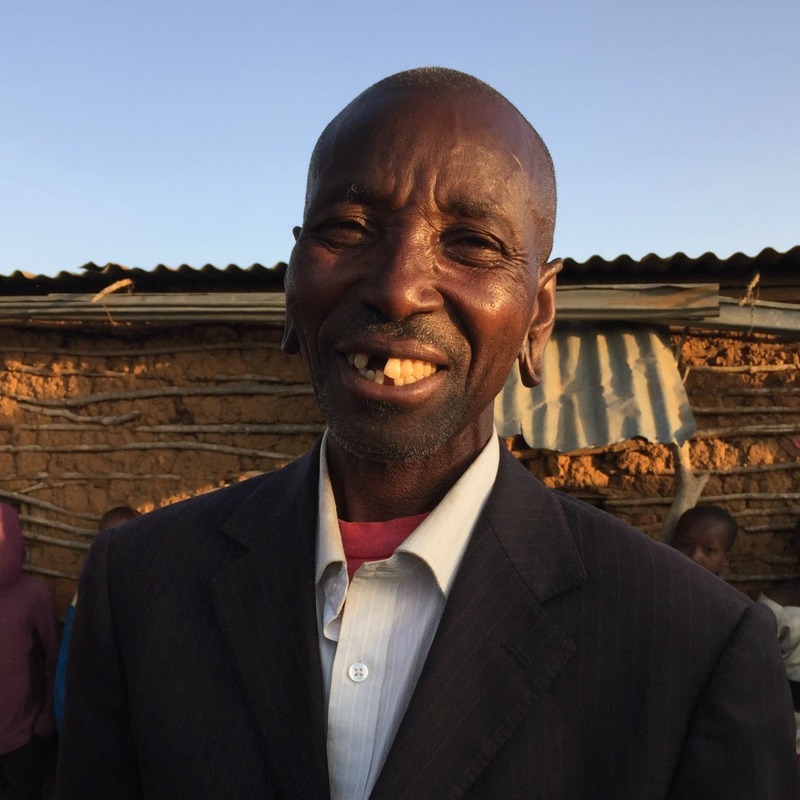 Samuel Lemaramwit (Samburu), who heads the village Council of Elders in Longewan village, lost a son in 8th grade during the war and said that the experience turned him into an advocate for peace. Elders used to bless warriors before they set out on a raid, he explained. But after their children started to attend peace camps, the Elders began to denounce the warriors. They never needed to issue a curse – the ultimate reprimand – but their disapproval was unmistakable and the raiding began to slow. Samuel has since visited his former enemies and hosted them at his home in Longewan. He has also helped to find and return animals that were stolen from the Pokot. The story of how warriors turned their backs on fighting is dramatic. As with Elders, many warriors are fathers and they were also impressed when their children began consorting with the enemy at peace camps. Warriors also began to feel the pressure from progressive Elders like Samuel from Longewan. As the community‘s admiration turned to disapproval, the warriors began to lay down their guns. Some Pokot did not appreciate the transformation. 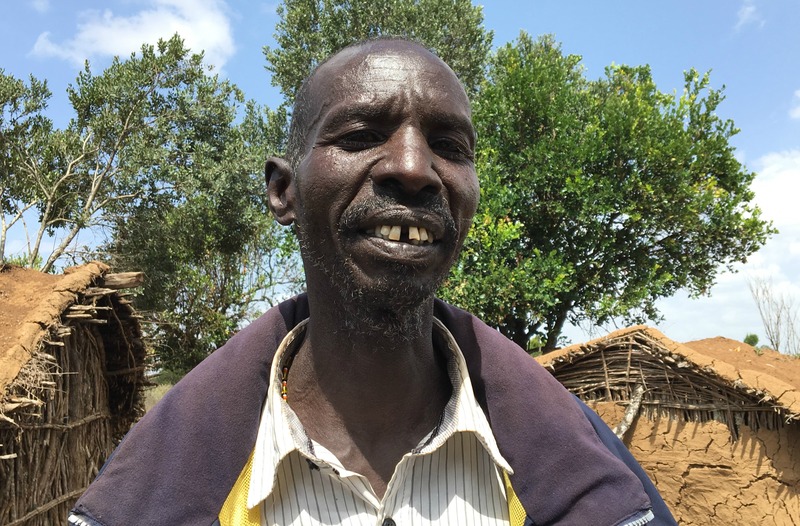 Kanye Kera (Pokot) was a fierce warrior in Amaya village until his son attended a peace camp. He then began to reach out to his former enemies, and when Pokot raiders from the interior came through the village and returned with stolen Samburu animals Kanye confronted them and retrieved the animals. On one occasion he even staged an ambush against Pokot to retake stolen Samburu cows and was accused bitterly by the bandits of betraying his own tribe: “Now you are not our brother. You are not Pokot. You are Samburu,” they told him. As the former warriors have lost their aura of menace, it has become safer from families from the other side to cross the tribal lines. 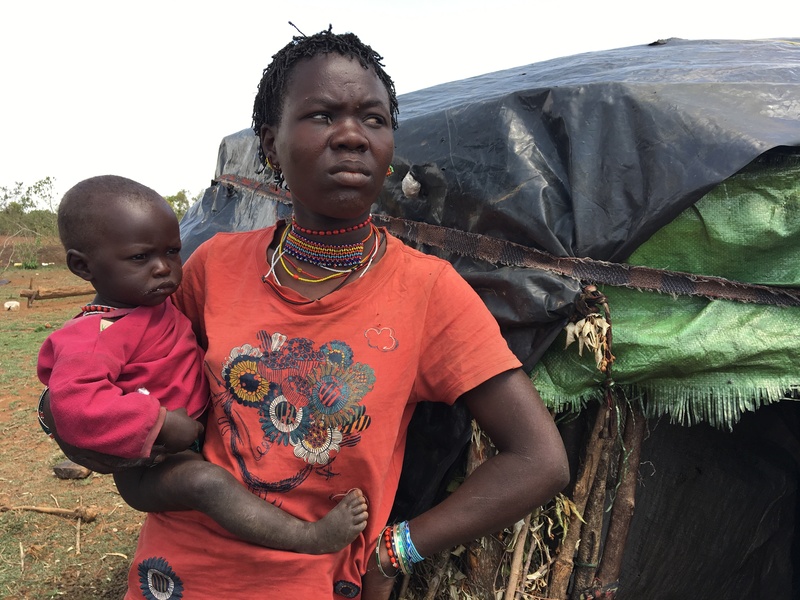 Chepranyei left her parents and home on the Pokot side with her baby after the rains failed and moved onto Samburu land. She lives next to Losieku Lekisima, a former Samburu warrior who even helped to build her house. Losieku has also helped to locate and return stolen animals from the Pokot side. 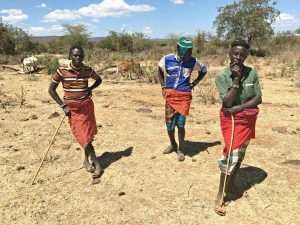 From heroes to bandits: The end of conflict, and the drought, has put pressure on former Samburu and Pokot warriors. For many former warriors, the transformation has not been easy. Frances Changulu, 27 (Pokot) gave up raiding and joined CPIK’s program in 2012. Two years later he dropped out of school because he could not afford the tuition. When AP met him in 2017 he was unemployed and had lost 24 of his 27 cows to drought. But this had not stopped him from returning five stolen Pokot cows to the other side – an act, he said, which had made him feel “more like a warrior than ever.“ In spite of being unemployed, Frances said that a return to fighting was unthinkable but he is also under pressure to make ends meet, particularly as food is more scarce and expensive than on the Samburu side. Many former warriors have turned to selling charcoal, which is bad for the environment and actively discouraged by CPIK and Elders. As the threat of violence has receded, cooperation between Pokot and Samburu has deepened, making a resumption of fighting increasingly unlikely. It also makes sense because of disparities between the Pokot and Samburu communities. Amaya (Pokot) is the poorer of the two and also more susceptible to drought. 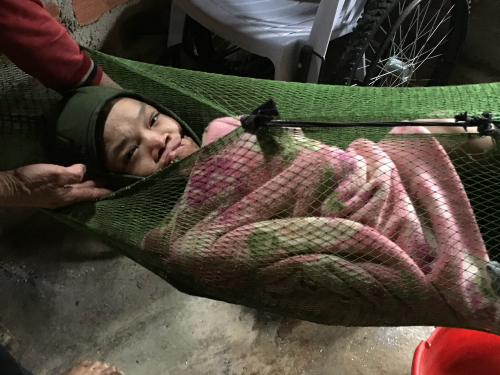 We met one young mother, Lorot Chaptoyia, who had carried her baby for three hours from Amaya to buy maize and sugar in Longewan, where food is cheaper. Government services are also better on the Samburu side. Since the fighting stopped, a growing number of Pokot women have been visiting the Longewan maternity clinic. Simaloi Dorcas, the nurse at the clinic, said that almost a third of the 362 women who visited the clinic during the first six months of 2017 had been Pokot. Equally striking, 80% of the protein bars given out by the clinic to supplement the nutrition of pregnant women and nursing mothers had been given to Pokot. This showed not just that Pokot women were more in need, but that they felt confident enough to seek support among their former enemies. Such joint use of government services would have been impossible during the war. The disparity between the two sides can even create comparative advantages. Longewan (Samburu) is at a higher altitude and attracts rainfall earlier than Amaya (Pokot) which means that the maize ripens sooner. High on the plains of Longewan we met Namuk Losangeri and his son, Arrupe Namuk, two Pokot who were harvesting maize for Samuel Lemaramwit (Samburu) for 700 shillings ($7) a day. When the harvest ended, they planned to return to their own land in Amaya and prepare for their own harvest. 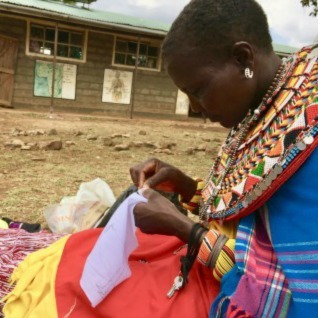 Women of influence: Josephine Lengepyani, a Samburu, has built a business by trading with Pokot and is breaking down gender barriers. CPIK provides a further incentive to cooperate by giving a cow to families from the two sides on the condition that they rear the animal together. Each cow can be expected to produce milk (which sells for 200 shillings – $2 – a week) and give birth to up to 8 calves. This means that both families have a strong interest in making sure that the animal thrives, which tends to resolve any disagreement over which family should care for the cow. 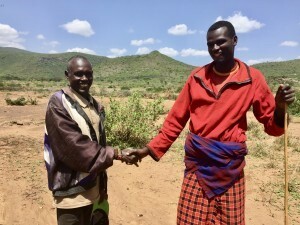 After Malatu Lebenayo (Samburu) and Losuke Lonyangaking (Pokot) received a cow from CPIK in 2015 they decided that Malatu should take the cow because he has access to better pasture land. George Gamiya (Samburu) and Christine Chepteiya (Pokot) came to a similar conclusion. It meant that George would be able to sell milk during the early years, but it would be worth the wait for Christine. 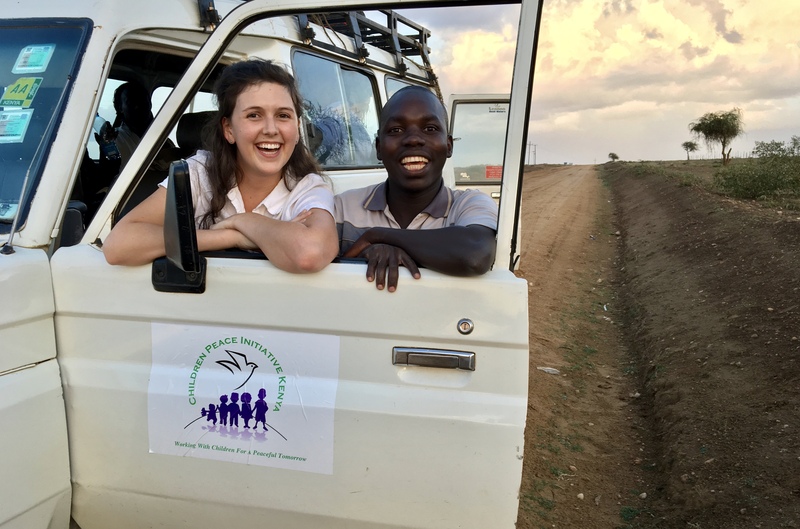 At 20,000 shillings a cow, Heifers for Peace is not cheap and for the last two years CPIK has relied on Peace Fellows Talley and Colleen to raise the money (over $10,000). 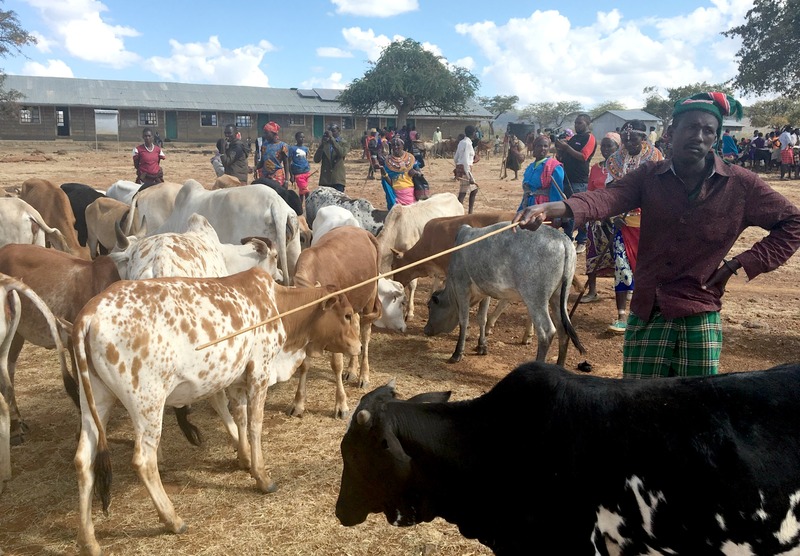 But the investment has paid off and benefited communities as well as individual families, as Iain Guest from AP saw in November 2018 when CPIK distributed 51 cows at the remote Pokot village of Plesian. Villagers came out in force from both sides to pray at the church, dance, and accept praise from village elders and local government officials. 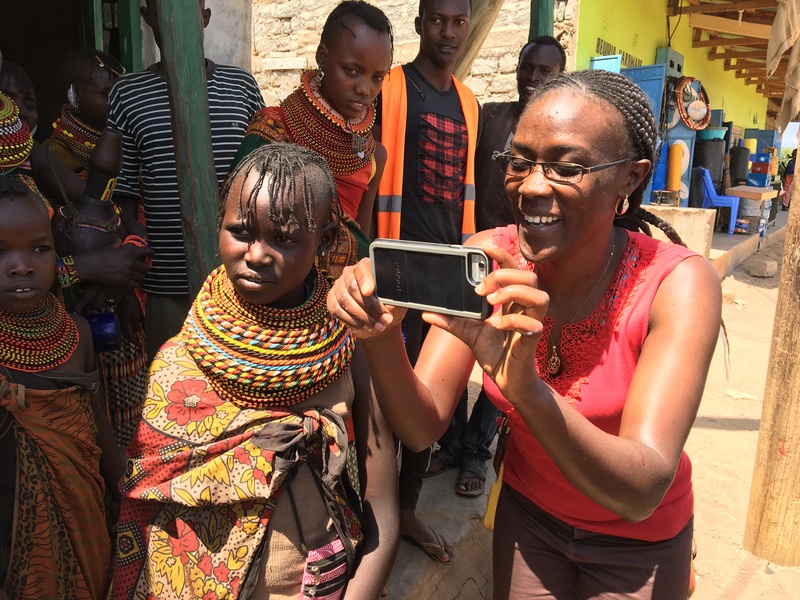 For many it was also a chance to make new friends: after Esther Lenosilale (Samburu) with Eliza Amrara (Pokot), she visited Eliza’s home for the first time. The main threat to this imaginative program comes from drought, which has decimated herds on both sides. CPIK’s cows have suffered a lower than normal death rate but they are still not immune. 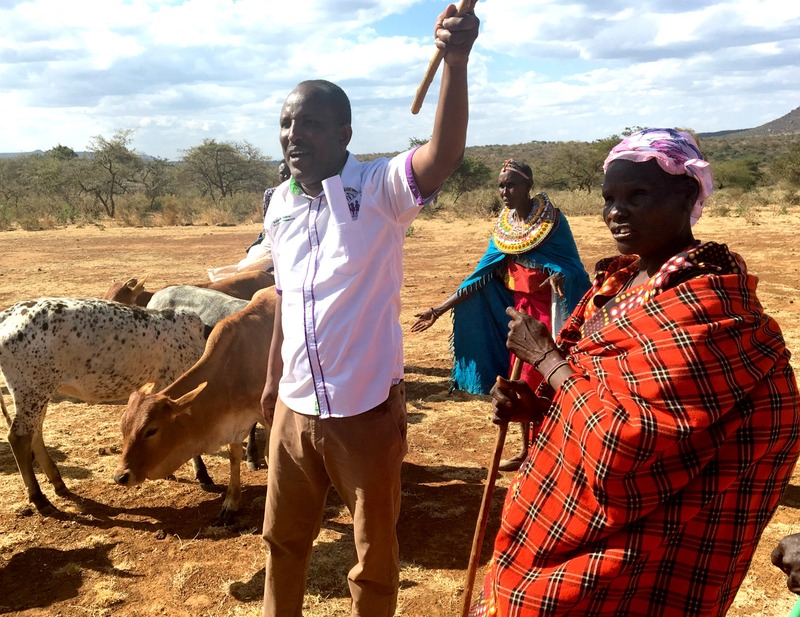 Kip Kiyeng (Pokot) joined Heifers for Peace in 2015 and received a calf from his Samburu partner in October 2018. A month later the animal died, in spite of three visits to the nearby government veterinarian. Kip was convinced that the calf had been ill when it was handed over, and planned to ask his Samburu friend for the next calf born to their joint cow. But he also understood that this would test of their friendship. Government will play a key role in encouraging inter-ethnic cooperation in Baragoi. As noted above, government came late to Samburu County and officials made many early mistakes in handling the tribal conflict. But the Pokot-Samburu peace shows how it could be done differently. This starts with the police, whose heavy-handed response to cattle raids in Baragoi has created enormous resentment. Ben Karanja, the police chief in Langewon (Samburu) said that there had been 17 cases of theft in the village in the first six months of 2017, almost all by Pokot, but that over 90% had been resolved by the community. The last murder to occur in Langewon had been in 2012. Ben is in regular contact with his counterpart of the Pokot side, but they only step in when things get out of hand, which almost never happens. It probably helps that the two officers are not from either tribe. Government can also help to deepen peace by recruiting teachers from both tribes (which encourages integration) and by providing licenses for common markets. But such a combination of restraint and intervention requires a subtle touch and self-confidence, which have been lacking in Baragoi since the massacre of 41 police by raiders in December 2012. Working with the local government will be one of the many challenges facing CPIK in Baragoi. The organization has developed an excellent relationship with government officials in Maralal, the County capital, and officials in the (sub-county) Baragoi have hinted that they would welcome CPIK’s mediation. But CPIK is well aware of the need to remain independent. No doubt this will test CPIK’s skills even further during the months and years ahead. Esther (also known as Mama Caleb) has been an enthusiastic supporter of CPIK ever since she enrolled her son Caleb in the first Peace Camp in 2012. Mama Caleb had lost her father and a grandchild to the conflict and credits CPIK with helping to bring peace. She is sharing a cow with a Pokot friend under the Heifers for Peace project and making squares out of beads for a “Cow Quilt” with a Samburu friend, Mama Faith. Read Colleen’s blog. Samuel heads the Council of Elders in Longewan Village (Samburu) where he has played a key role in helping to end the conflict. Samuel can recall in vivid detail how the village was routinely attacked by Pokot raiders and estimates that 35 villagers were killed during the war (out of a 2017 population of 412). Samuel, seen here with other Elders in Longewan, turned against the conflict after his children attended a CPIK peace camp. He now enjoys his own peace dividend by hiring Pokot workers to harvest his maize. Evelyn Mung’a is the deputy principal at the Plesian School in Pokot territory. She remembers how Samburu raiders used to sweep through the village, killing women and children, and is deeply grateful to CPIK for helping to end the carnage. Evelyn has helped CPIK to organize activities on the Pokot side and helped AP to raise funds for Heifers for Peace in 2017. Known as the “Camel” to friends because of his great height, George went from being a Samburu warrior to serving in the Kenya police force. Now retired, he told AP in 2017 that he had lost 4 out of his 5 cows to drought. The surviving cow had been given to him and a Pokot friend by CPIK in 2015. 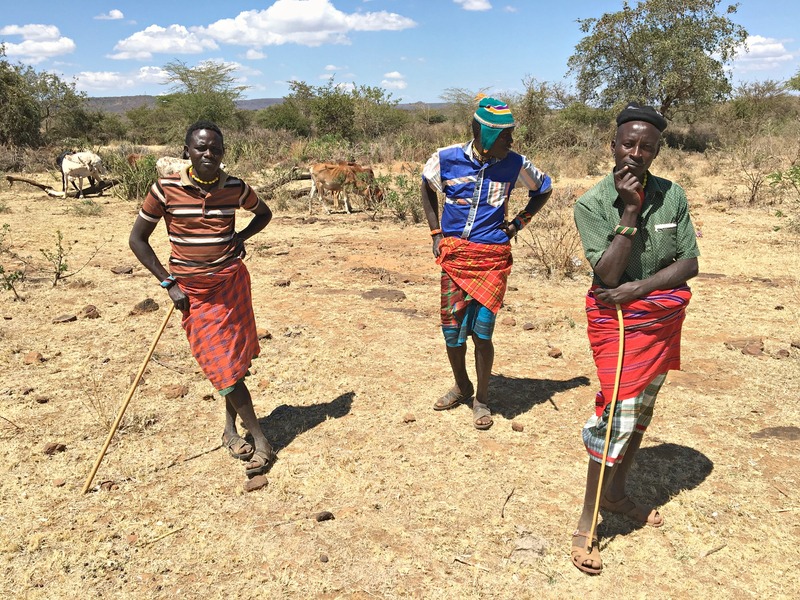 Like many herders, George is deeply troubled by the combination of drought and disease and would welcome help from specialists in livestock management. Helen (Pokot) and Chebet (Samburu) were nervous about attending a CPIK peace camp in the Samburu village of Logorate in July 2018. 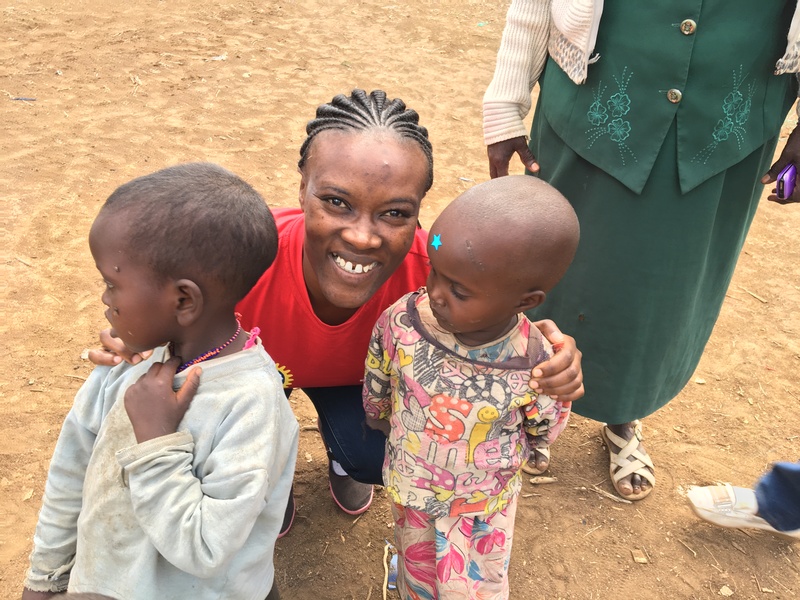 Both in grade 6, they had never met anyone from the other side, although Chebet’s older sister has attended a camp and told her what to expect. As Peace Fellow Colleen reported, Helen and Chebet became fast friends before the camp even began and were quickly “twinned” by CPIK. 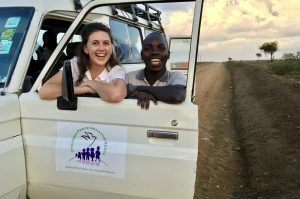 During the 2017 camps Chebet’s father Lotit came by on his bike to see how his daughter was getting on and was delighted to be introduced to Helen. Another example of how children can steer their parents towards peace! Read Talley’s blog. Faith and Mary were a bit shy about meeting with AP in August 2017. This was understandable because they were the only Pokot among 499 students at the Logorate Primary School deep in the middle of Samburu territory. But, they said, they have plenty of friends at school and spend their holidays with Samburu friends. The girls are also doing well in class: Esther came in 18th out of 47 in her class, and Faith was 20th out of 64 students. The girls don’t come across as pioneers but that is exactly what they are: it takes a lot of courage to break down the barriers of segregation, especially at school. We met Naanyu and Diana during a visit to the Pokot territory in August 2017. They told us, with a twinkle in their eyes, that they were attending boarding school in Samburu land “in order to get away from our families.” On a more serious note, here was another example of brave girls promoting integration. It usually starts in school. Anne (Samburu) and Naomi (Pokot) have been close friends since attending a peace camp. 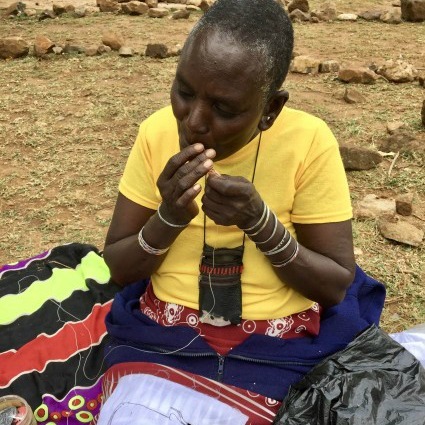 When AP met them in November 2018, Anne (Samburu) had trekked across the mountain to attend the ceremony with her Pokot friend Naomi at which CPIK distributed cows in the Pokot village of Plesian. They are seen here with Hilary Bukono, the founder and director of CPIK. Impressed by the girls, CPIK decided to give the two families a cow. When Peace Fellow Talley met Tanapa, 16, at a 2017 peace camp he was studying at the Logorate School, where the school was taking place. But Tanapa was slipping out class to help with the camp. When they talked, he told Talley that he wanted to be a peacemaker. “Children can make peace because once they have been educated, they go and tell their parents to teach them about peace.” The following day Tanapa brought his parents to meet Talley. It became clear that the boy had had a huge influence on his family. Read Talley’s blog. Joseph met the AP team in 2017 when we crossed from Samburu territory into the Pokot village of Amaya and guided us during our stay. 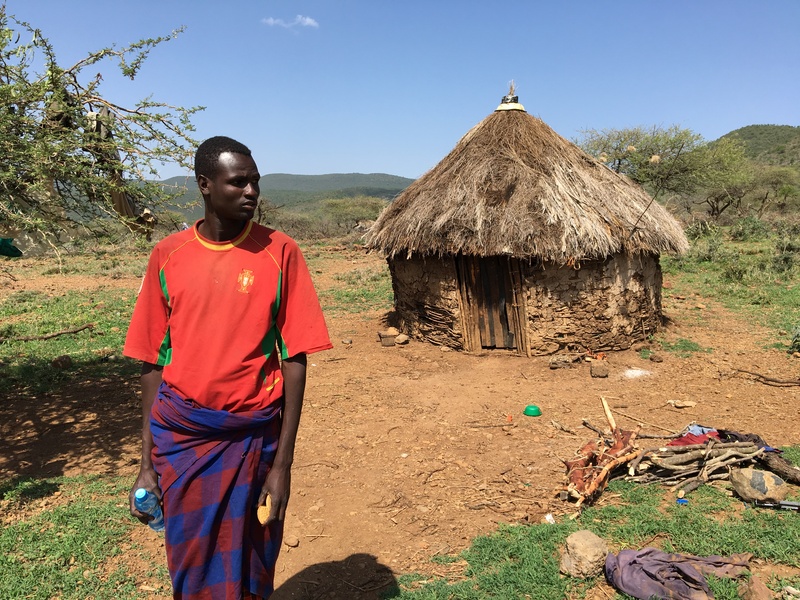 Francis sent his son to a peace camp, hosted Samburu friends, and is sharing a cow with a Pokot family. His son Francis is a former warrior who laid down his weapons and returned to school. Unfortunately Francis could not afford the fees and dropped out. Adding to this, most of the family’s animals have died from drought. Nonetheless, Francis remains resolutely determined not to return to raiding, with his father’s encouragement (See more on Francis in his profile below). 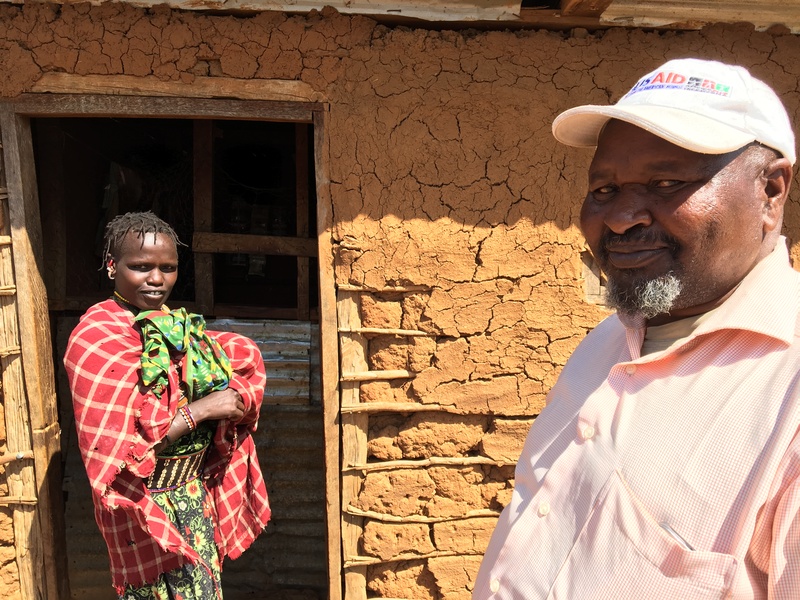 Peter is an influential Elder in the Samburu village of Longewan, which has been at the forefront of CPIK’s campaign to consolidate peace between the Samburu and Pokot. 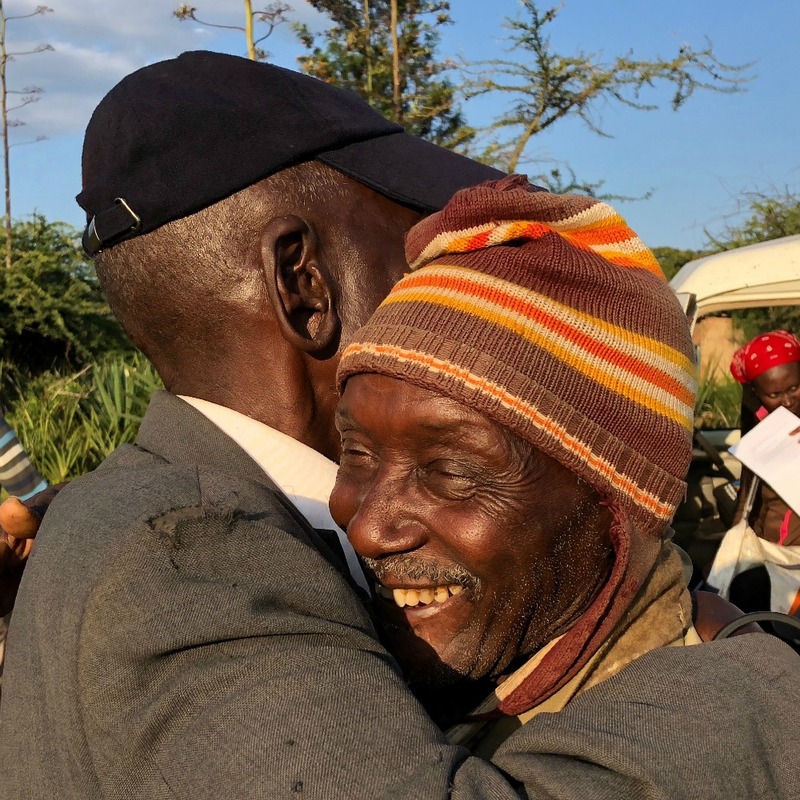 Like other Elders, he has partcipated in all of CPKIs activities – peace camps, homestays on both sides – and shares a cow with his Pokot friend. Kanye shows that former warriors may need as much courage and determination to defend the peace as they did to fight. After Kanye (a Pokot) enrolled his children in a CPIK camp he stopped fighting and turned to enforcing the peace. On one occasion he confronted Pokot raiders from the interior who were returning home with stolen Samburu cows and returned the animals to their rightful owners. This earned him a bitter rebuke from the raiders, who accused Kanye of betraying his own people. Chepranyei (Pokot) had Samburu friends before the war. After peace came, the family’s herd was devastated by drought and when we met her, only ten of the sheep were still alive. 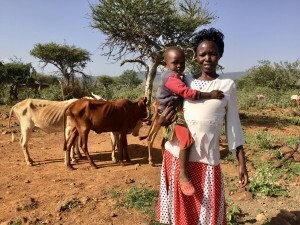 She decided to leave the family homestead with her daughter Keptyos to seek better pasture land on the Samburu side, even though it meant abandoning her parents. While the drought is devastating, the long peace allows families on both sides to seek out the best grass without fear of being attacked. Losieku was a Samburu warrior before laying down his arms and he now herds cattle in the bush near the village of Longewan. 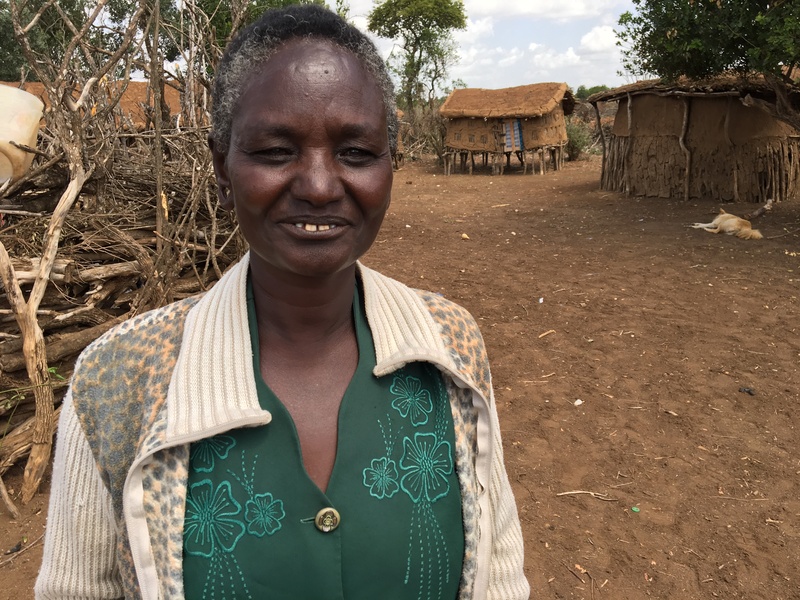 When Chepranyei arrived with her daughter from the Pokot side, he helped her to build her house – a small example of how the end of fighting has transformed attitudes and built bridges between the former enemies. Francis, a former Pokot warrior, exemplifies the wrenching change that has affected former warriors since the end of fighting. Francis attended a peace camp and decided to return to primary school at the age of 25. Unfortunately, his family could not afford the fees. Making matters worse, 24 of the familiy’s 27 cows had died from drought when he met AP in August 2017. In spite of these reverses, Francis had never wavered from his determination and had recently returned 5 stolen Samburu cows to the other side. “The peace program told me I don’t have to steal,” he says. “I am still a warrior and proud of it but now I return stolen cows. It is a transition from child to man.” This profound observation shows that CPIK has made peace cool with these restless young men. Lorot Chaptoyia, a Pokot woman, walked for three hours from the village of Amaya to buy essential foodstuffs in Langewon (Samburu) where maize is cheaper and more available. This underscores the differences between the two villages and reinforces the importance of complementarity at a time of water and food shortages – another important peace dividend. 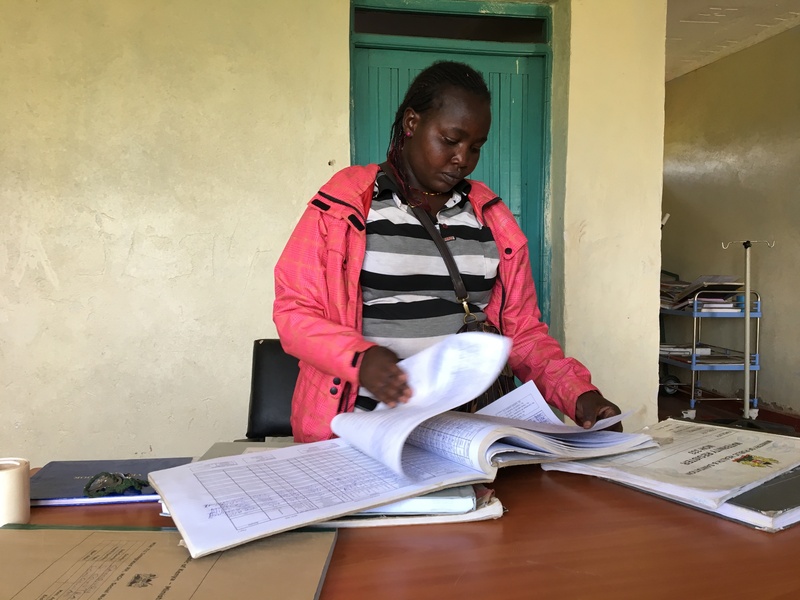 Simaloi is nurse at the maternity clinic in the Samburu village of Langewon and her records showed how much Pokot women have come to rely on this important government service. Of the 362 women who had made the long trek across the hills to visit the clinic in the previous 5 months, 102 were Pokot. Many took advantage of their visit to shop at the Samburu market. In addition, said Simaloi, over 80% of the nutritious peanut bars given out to mothers had gone to Pokot. This was another reminder that the Pokot in this area are poorer than Samburu and also dependent on government services that are, for the most part, in the territory of their former enemies. Peace makes this possible. Namuk and his son Arrupe are from the Pokot village of Amaya. When we met them they were working the fields outside the Samburu village of Longewan, harvesting the maize of Samuel Lemaranwit. Namuk explained that the Samburu side gets better rains and that the harvest comes earlier. Once the Samburu harvest was finished he would collect maize from his own land. This shows how the different level of resources, which appears to favor the Samburu, can actually be a win win for both sides. 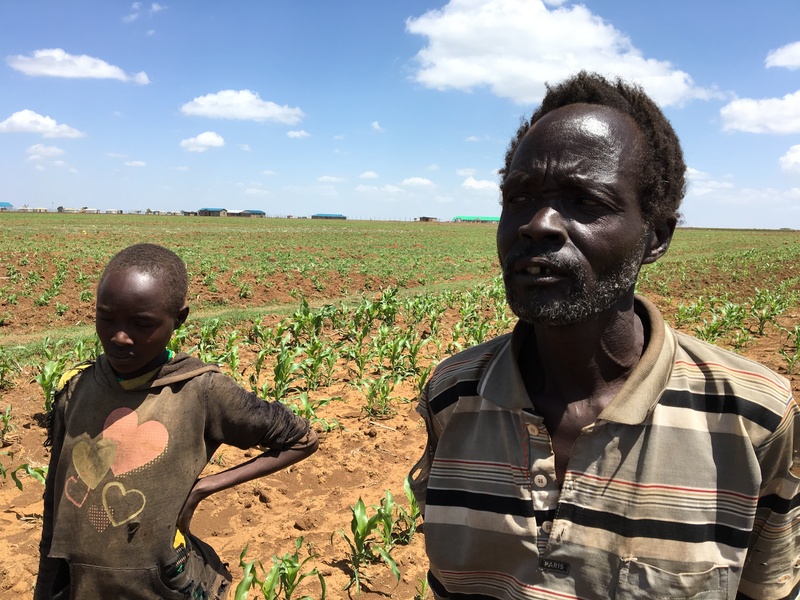 Namuk and his son were making around 700 shillings ($8) a day, and helping Samuel meet his need for workers. Josephine was an early supporter of CPIK and has benefited from the resulting peace more than anyone else we met, while also breaking down gender barriers. After peace came she set up a thriving business to grind the maize of Pokot farmers on the other side. Her clients bring their maize to Longewan, and then pick it up on Wednesdays, when they visit the Longewan market. 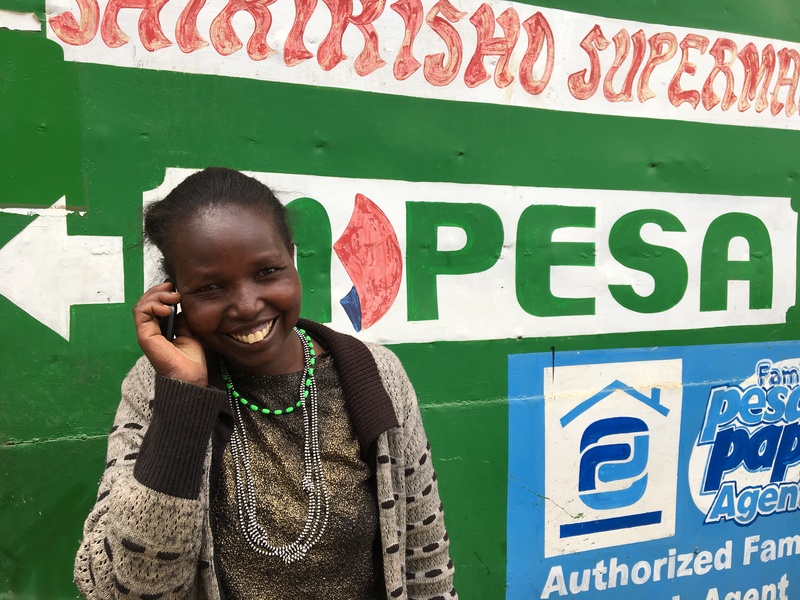 Josephine uses the banking service M-PESA to make transfers by mobile phone. As her business has grown Josephine has become influential in the community. She is a living example of how peace can also change gender stereotypes and strengthen women. 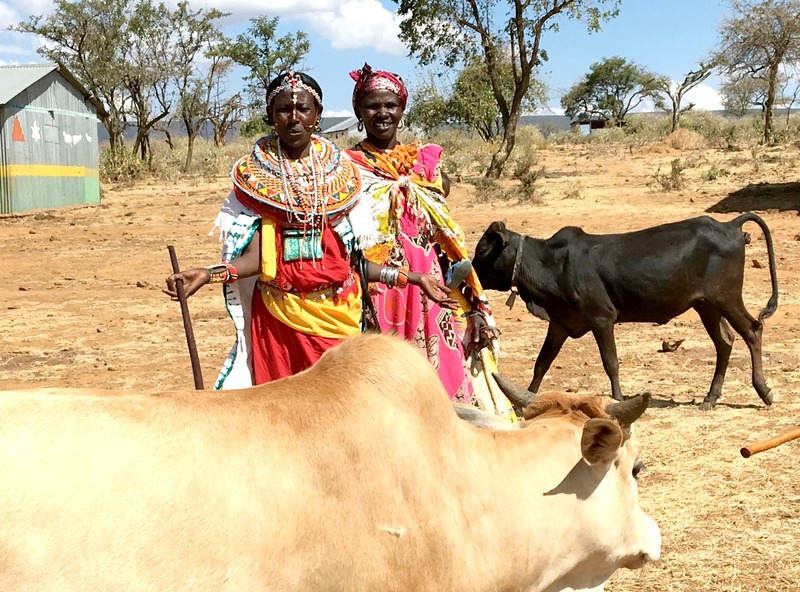 Eliza and Esther were among the hundreds of family members from the Pokot and Samburu who assembled at the Pokot village of Plesian in November 2018 to receive and share 51 cows. This was the climax of the second phase of CPIK’s flagship project, Heifers for Peace, and the fact that so many villagers attended the ceremony was further proof that CPIK’s model has widespread support among both tribes. The biggest challenge will come from the drought. CPIK’s long-term goal is to improve livestock management in partnership with the local government and Caritas to improve the health of livestock. 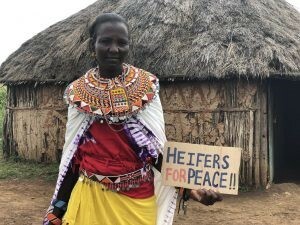 Joyce Leririo, more commonly known as “Mama Faith,” is a shy Samburu woman who received a heifer for peace in 2015 with her Pokot family the Mamkong family. Unfortunately, the heifer died because of drought but she and the Mamkongs are still friends, showing that inter-ethnic friendships can survive a serious setback. Much of this has to do with the wider peace dividend. Their daughters became friends in CPI Kenya’s 2012 Peace Camp and still visit each other every school holiday. Mama Faith explains: “They were so happy to go back to school once there was peace, and I was so happy too. They now school without interruption, we are able to again eat three meals a day, and everyone’s health has improved because of food and because we have peace of mind. Mama Faith is making cow squares for a quilt with Mama Caleb. The two hope that AP and CPIK can use the quilt to promote their great work. Read Colleen’s blog. Children Peace Initiative Kenya (CPIK) was launched in 2011 by Hilary Bukono to promote peace in the Northern Rift Valley of Kenya. In the years since, CPIK has worked with five tribes – the Gabra, Rendile, Turkana, Samburu and Pokot – and conducted over 100 inter-community peace activities with children, parents and teachers, including 12 peace camps. These have reached approximately 250,000 beneficiaries, including the more than 3,000 children who have attended camps. CPIK has a head office in Nairobi and has received funding from Rotary International, the Catholic Organisation for Relief and Development Aid (Cordaid), Japan International Cooperation Agency (JICA),the University for Peace in Costa Rica (UPEACE), The Advocacy Project and Tangaza University College in Kenya. The following profiles are adapted from a 2017 blog by Talley Diggs, who worked at CPIK as a Peace Fellow in 2017. Hilary brings 15 years of experience of peace-building to his role as director of CPIK. He was born in the northern region of Marsabit and worked for Caritas at the Catholic Diocese of Marsabit as Coordinator of Justice and Peace Office. He also holds a Master’s Degree in Peace Education from the UN University for Peace in Costa Rica. Hilary launched CPIK in 2011 after meeting Jane and Monica Kinyua, who were on a visit from Nairobi to work with refugee children. He was struck by the fact that children are rarely involved or mentioned in conflict resolution. Together they decided to change this. Hilary is from the Gabra, one of seven tribes in Samburu County that have experienced conflict. This gives him credibility, contacts, and a deep understanding of the root causes of violence: “I understand the pastoralist conflict and the dynamics that shape the conflict,” he said. Monica has a heart of gold but is also tough-minded and practical. As a result she and Hilary complement each other perfectly and make a dynamic team. Her generosity knows no bounds. She greeted me (Talley) at the airport and she made me feel at home in Kenya since my first day. One of the highlights of my time in Kenya was a weekend spent at her home in Kirinyaga County exploring tea plantations. Monica is a Rotary Ambassadorial Scholar and she holds a Master’s Degree in Peace Studies from the University of San Diego, California. But her real passion is children. She is a trained teacher and has several years of experience working with children. The idea of CPIK was born when she and her twin sister, Jane, visited Marsabit. It was on this trip that they met Hilary, who saw them playing with children and got the idea for a peace-building program built around children. Ever since, she has worked hard to help to help Hilary build CPIK into a successful organization. She has a natural talent and ease when it comes to teaching. 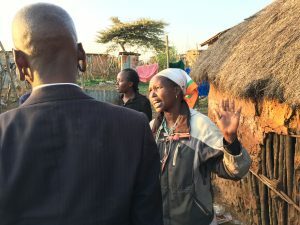 I love watching her engaging with our beneficiaries and bringing joy to CPI Kenya’s activities. The best way to describe Jane is as a people person. 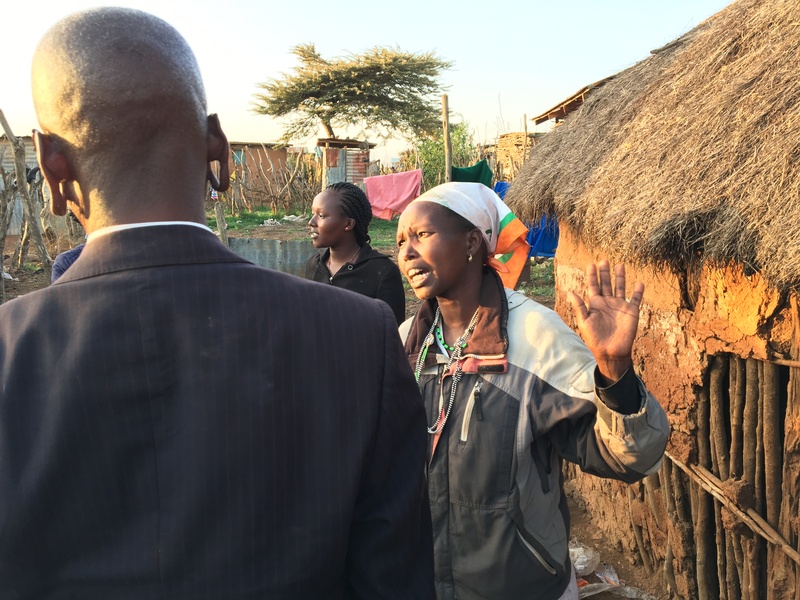 She is empathetic and thoughtful when interacting with beneficiaries in the field. She cares deeply about their stories and values their experiences. She is currently working on a book that tells the stories of the families who have been impacted by CPI Kenya. Jane has worked with young people who were acquitted for juvenile crime as part of a government program to rehabilitate young people under CEFA, an international NGO, for 3 years. In 2017 she followed her sister to the Kroc Center at the University of San Diego to pursue a Master’s degree in Peace Studies. “I hope to gain new knowledge and skills that will help CPIK to measure the impact of our programs our value to beneficiaries,” she says, adding that she plans to focus on the role of women in peace building. 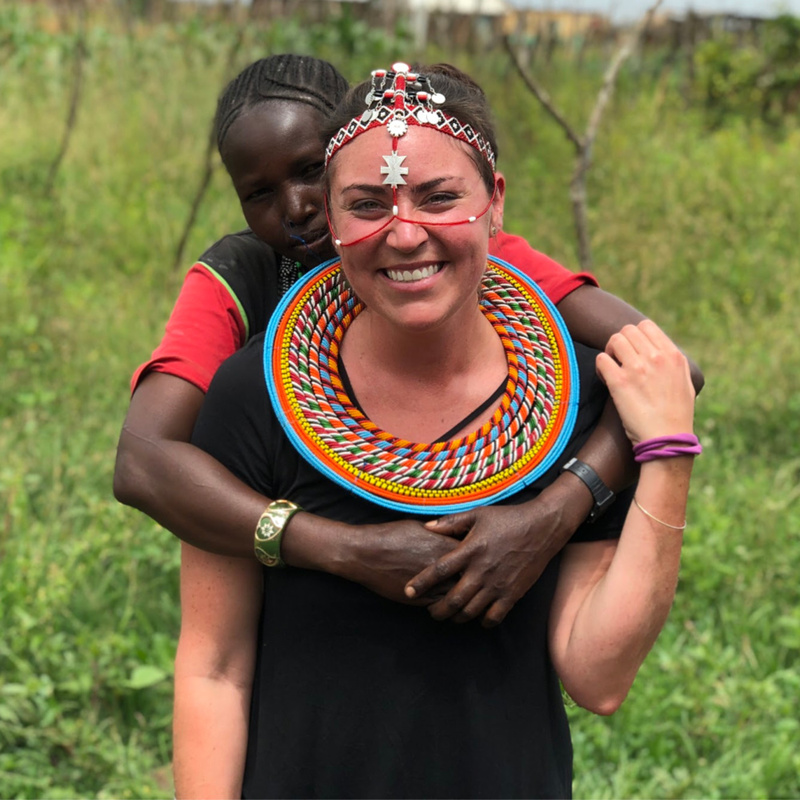 Working in the US will, she hopes, will enable her to promote CPIK’s work outside Kenya build a network of American support. Check out our CPIK photo library on Flickr. These photos can be used without charge. Please acknowledge AP and CPIK.